I was one of the very fortunate people invited to speak at the recent TriAgile 2016 Conference in Raleigh, North Carolina. This was a great honor and a privilege for me and not one that I had undertaken lightly. Indeed, I had spent a lot of time pontificating over what topic I should speak about; should I delve into the right way to do stand-ups? Or focus on the difference between progress and status updates? Maybe give a master class on story pointing? All of these and many more appealed, but one topic kept coming back to my mind – if so many of us have shifted towards an Agile way of working, why is Agile not the de facto model for projects? 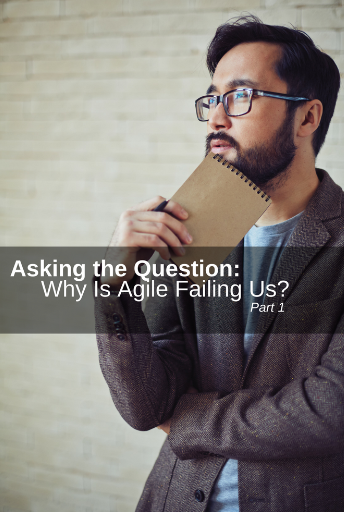 Why is Agile Failing us? The concepts of Agile have been around for a while now, Scrum since 2001 for example or even Taiichi Ohno 60 years ago and the early days of the Toyota Production System which lead to Lean. So, why are we still struggling with agile concepts and processes? Why do we not deliver more successfully all the time? Considering Agile to be better than Waterfall does not mean Agile is successful. As a concept of principles and values Agile offers some excellent guidance for us all to consider but they are not always embraced as they should be. Often we find organizations that are struggling to use or implement Agile. Sometimes this struggle is due to the fact that they are using Scrum as a process but not the agile principles and values. Or they may be doing Waterfragile, the concept of saying you are doing Agile but really have not left Waterfall behind. Alternatively, the agile rollout may just be an experiment within the company and therefore not truly committed to it. Is this any different from setting it up for failure? All of these, and many more, are common reasons for the failure of Agile Transformations. However, what if the organization truly ‘gets’ Agile and Scrum, is indeed using Scrum and being Agile - not just doing Agile? What if it still isn’t working? Should we ask ourselves if there is there something that Agile is missing or doing incorrectly? Or are we simply not using all that Agile offers us? For my part, I was wondering if I had made a mistake in submitting this topic. To be continued in part two of this blog, stay tuned!